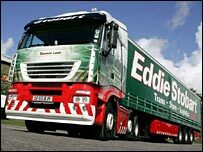 Eddie Stobart, the UK's best-known road haulage business, is motoring towards a listing on the London Stock Exchange. The move follows after the firm announced plans to join with property and logistics group Westbury Property Fund in a complex reverse takeover. While Westbury is paying £138m to buy Eddie Stobart, Stobart's owners are buying Westbury's property portfolio for £142m. The merged group will be called Stobart and take up Westbury's share listing. It will combine Eddie Stobart's road transport, warehouse and rail freight operations, with Westbury's own rail freight business and port at Runcorn in Cheshire. Eddie Stobart's current owners, William Stobart and Andrew Tinkler will run the merged company, taking up the roles of chief executive and chief operating officer respectively. Westbury's property portfolio is being bought for £142m by Mr Stobart and Mr Tinker through their separate business WADI Properties, which will operate independently from the merged Stobart group. Founded in 1970, Eddie Stobart has a cult following among members of the public. Its distinctive lorries, each sporting a unique female name, have inspired a fan club, members of whom compete for the most sightings of Eddie Stobart trucks. A range of toys and T-shirts are also available, and there has even been an animated TV series centred on a truck called Steady Eddie. 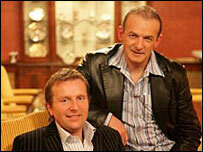 "Eddie Stobart has a large and loyal fan base," the firm said in a statement. "There are thousands of fans who collect memorabilia and attend events, and a large number who compete in the 'Spotters League Table'. "For many, the metamorphosis of Eddie Stobart to a publicly-listed company will mean that they can now invest and own a part of the business." Based in Carlisle, with sister sites in Warrington and Daventry in Northamptonshire, Eddie Stobart operates from 27 sites across the UK. Mr Tinkler and Mr Stobart will hold 28.5% of the new company following the merger. Westbury has also announced the acquisition of Widnes-based freight handling firm O'Connor for £23m, alongside the Eddie Stobart merger. The merger of Westbury and Eddie Stobart still requires the approval of Westbury shareholders, but this is expected to be successful.